← Mayor Tony Lloyd responds to our Open Letter. Some months ago we reported on our attempts to encourage Greater Manchester Pension Fund to rethink its investment strategy, using explicit ethical criteria as part of its overall strategy for sound investments and returns, and in particular to move money from fossil fuel companies to the viable economy – where possible the local viable economy. With 15% wiped off the value of mining giant Glencore in two days this week, (some £9M of GMPF’s money) and falls in other fossil fuel companies over the last year and more, GMPF’s exposure is looking like a poor financial strategy (in ensuring pensions can be funded), as well as a highly environmental practice. Now the campaign has got a lot bigger. Nationally, Friends of the Earth and the Fossil Free campaign have, using Freedom of Information requests, collated data on all the local authority pension funds in the country. This shows some £14 Billion of fossil fuel investments. And the biggest pension fund, our own Greater Manchester Pension Fund accounts for approx £1.3 Billion (nearly 10%) of that. Indeed, it is one of the highest investors in fossil fuels in the land, with 9.8% of its money in potentially unburnable carbon. Today, Steady State Manchester was pleased to be part of Manchester Friends of the Earth Action at the GMPF Headquarters. You can sign their petition HERE. The action made BBC North West tonight – see the coverage http://www.bbc.co.uk/iplayer/episode/b06bpsnm/north-west-tonight-24092015 It starts at 16.04 minutes in. In the window, GMPF proclaim “Looking after the pensions of a thrid of a million members” – but given 10% could be in stranded assets, how accurate can this claim be? Here is a report on today’s demonstration at GMPF’s headquarters in Droylsden, from the Manchester Friends of the Earth website. 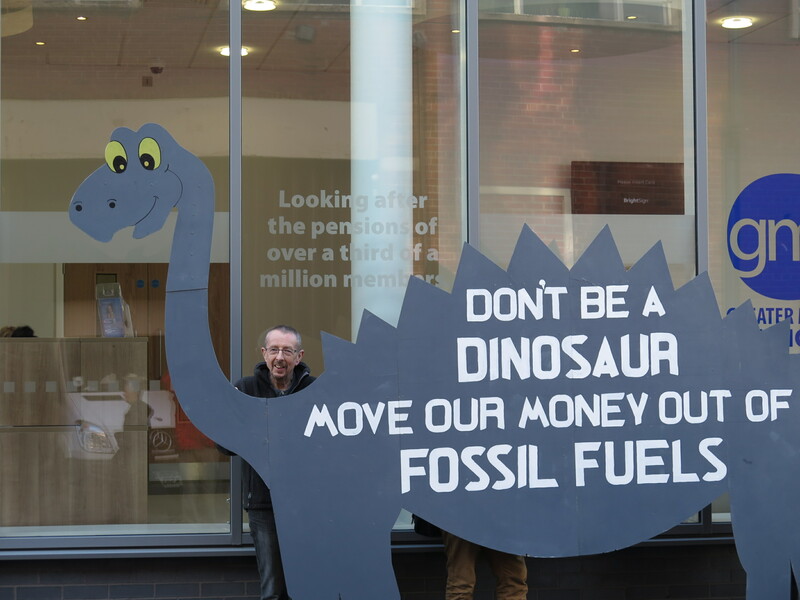 Earlier today, a giant ‘dinosaur’ visited the Greater Manchester Pension Fund office in Droylsden, Tameside to call on the pension fund to divest from risky investments in fossil fuels. 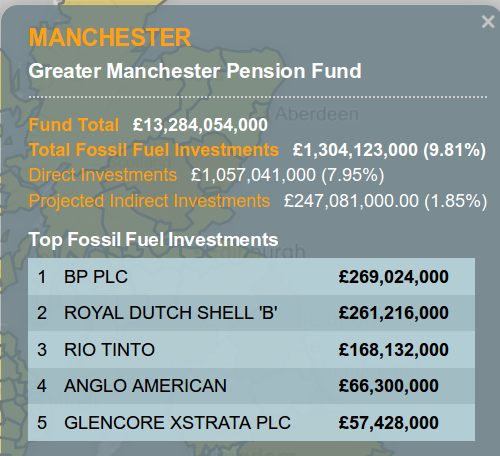 The Greater Manchester Pension Fund has 9.8% of its pension fund invested in fossil fuels. 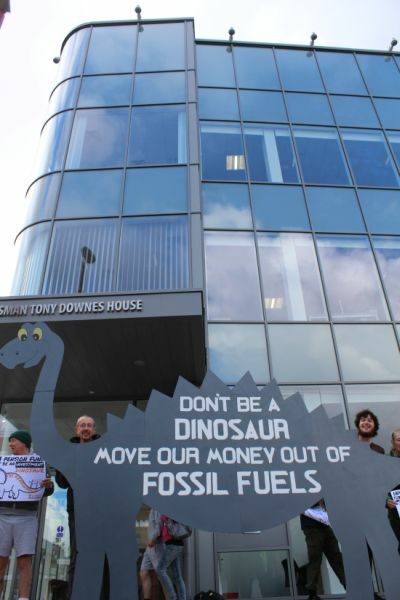 Money is invested into multinational fossil fuel companies including £269 million in BP and £261 million in Shell. Fossil fuel companies hold five times more carbon resources than they can burn if we are to meet the internationally-agreed safe limit of 2 degrees Celsius. This means fossil fuels are in fact stranded assets and must remain in the ground. Therefore, GMPF’s investment policy means Greater Manchester’s pensioners risk being left with worthless assets underpinning their retirement funds. This is the first time that the £231 billion of public money invested by local government pension funds has ever been broken down and released publicly, and their exposure to fossil fuels quantified. The data shows that overall the 192 councils in the UK have £14 billion invested in fossil fuels via their pension funds. This data, available at www.gofossilfree.org/uk/pensions, offers the residents of Greater Manchester the information they need to ask why the Council is choosing to invest in risky coal, oil and gas. Instead, the fund could reinvest this money into building new homes, clean renewable energy or public transport. 2. The data was sourced by 350.org, Community Reinvest and Platform through Freedom of Information Act requests to the 101 administering pension funds. This entry was posted in Climate Change, energy, environment, Greater Manchester City Region and tagged divestment, Friends of the Earth, GMPF, Go Fossil Free, Pensions. Bookmark the permalink.